South Street Films/Endeavour Productions - 99/101 min. Cast: Michael Murphy, Louise Fletcher, Dan Shor, Fiona Lewis, Scott Brady, Charles Lane, Dey Young, Arthur Dignam, Marc McClure, Beryl Te Wiata. Screenplay: Michael Laughlin, Bill Condon; Cinematography: Louis Horvath; Editor: Petra Von Oelffen; Original Music: Tangerine Dream; Makeup and Special Effects: Craig Reardon; Producers: John Barnett, Antony Ginnane; Director: Michael Laughlin. In a small Chicago suburban town, a police chief and his son get caught up in a nasty experiment that programmes teen-agers into killers. Auckland's Remuera district is standing in as the "small American town", and Auckland's Avondale College as the "friendly Galesburg College". You will probably spot One Tree Hill, when it still had a tree. Not a great film - either scriptwise or technically, but worth a watch for those who enjoy the genre and it is enjoyable observing the dress styles, old cars and dance styles of the 1970's. This US/NZ co-production was the first NZ "thriller" feature film. 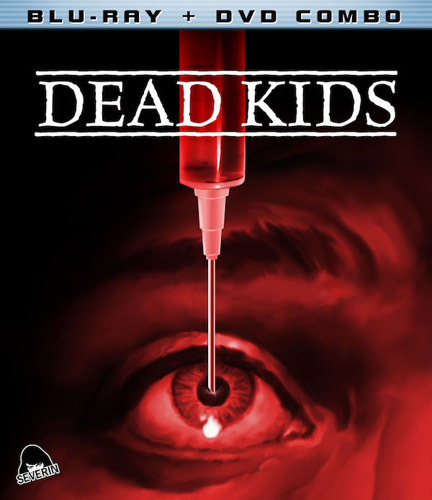 CLARIFICATION - In all markets, except the U.S., the title of the film is 'Dead Kids'. In the U.S. the title is 'Strange Behavior'. The theatrical World Premiere of 'Dead Kids' occured April 1983 in Auckland, however 'Strange Behavior' had a limited U.S. theatrical release during the fourth quarter of 1981. The March 2014 twin-pack described below is the first U.S. release with the film's original title. No known source for either new or used PAL VHS copies. New NTSC copies can be found for about $10us. Used NTSC copies will sell for about $6us. The DVDs are a new digital transfer with widescreen 2.35:1, enhanced for 16x9. R0 PAL DVDs are sold by Aro Video for $20nz and from Australian sources for under $20au. The R0 PAL extras are: Introduction by producer, Antony Ginnane, two short deleted scenes, stills gallery, two related trailers, plus trailers of other films that Ginnane is selling. New R1 DVD copies will cost about $18us. Special features include: optional commentary track with writer Bill Condon, and actors Dan Shor and Dey Young; Two deleted scenes; theatrical trailers; isolated music score; photo gallery. There are spoken English and Spanish DD 2.0 soundtracks. There are no subtitles. An All Regions 2.35:1, enhanced for 16x9, 1080p24 blu-ray version, transferred in HD from the original negative, became available starting 11 March 2014. It is packaged with an R0 480p NTSC DVD version. This 2-disc set is selling for about $22us. The Blu-ray has a spoken English DTS-HD Master 1.0 soundtrack. The DVD has a spoken English DD 2.0 soundtrack. In addition to including the commentary track used on the previous dvd, the Blu-ray has a new commentary track by the writer/director Michael Laughlin. There is also a 20 minute 1.78:1 featurette, ' The Effects Of Strange Behavior', an interview with Makeup Effects Artist Craig Reardon; a TV 'Strange Behavior' trailer (1:30) and a widescreen 'Dead Kids' trailer (3:00). The previous dvd's "deleted Scenes" have been edited back into the movie with this latest offering. There are no subtitles on either the Blu-ray or DVD. The extras have an English DD 2.0 soundtrack. Starting 23 March 2016, a Region B Blu-ray is being offered by Australian resellers, selling for $20-30au. The tech specs, except for the region code, are the same. Extras include the two commentary track options mentioned above, 'The Effects of Strange Behavior'(20:32) and 'A Delicious Conversation with Dan Shor'(45:00) featurettes and the two trailers mentioned above. WorldCat is the world's largest library catalog - Click to find the nearest Library that has 'Dead Kids'. WorldCat is the world's largest library catalog - Click to find the nearest Library that has 'Strange Behavior'.